Follow Me.Beginning Seminary - Follow Me. 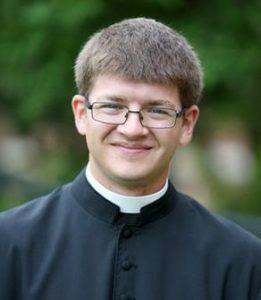 First year seminarian Michael Olsta reflects on his time so far in seminary. This article originally appeared in Into the Depths, the newsletter for the Office of Priestly Vocations. To subscribe to our newsletter, contact us. With the first month coming to an end, I can already tell that my decision to join the seminary will make a lasting impact on my life. While it would be unrealistic to say everything is perfect, I have had an incredibly positive experience. The struggle to grow in holiness is ever present, but the guidance I’ve been given continually challenges me. It’s already brought an overall growth in my prayer life. The access to so many experienced priests and a library full of great works gives constant inspiration for contemplation. As a diligent student, I knew I would enjoy going back to the books. Still, I think what I didn’t realize is just how quickly I could take the philosophical and theological lessons in our studies into my prayer. There is so much to draw from in just scratching the surface of our relationship with God through his Creation or reflecting on the works of Plato. Our instructors range from priests to lay professors, so the range of experience makes each class unique. Even when the material becomes difficult, it only helps build our fraternal bond out of that shared struggle and our support in study and work. Much of Mt. St. Mary’s draw also comes from the great environment it creates. The Immaculate Conception Chapel is an absolutely beautiful church, with detailed stained glass windows and beautiful altars. We’re blessed to have mass every day inside it. We’re also blessed to have the National Shrine of Our Lady of Lourdes a short (albeit high) stair climb away from us. The grotto is the perfect place to pray the rosary. As a nature lover, I find great contemplation in just soaking in the sounds of the babbling brook and the multitude of wildlife that are in the forest around the grotto. Our fraternal living has also been Incredibly rewarding. Our daily prayers are a constant reminder of our shared purpose as men seeking God’s will in our lives. While no two men are alike, this guiding force makes relating to each other easy. This is especially true in our years. Spending at least three or four hours in class together, you quickly learn everyone’s personalities. With so many brothers together, it also means that there are plenty of different opportunities to relax in our free time. From movies on weekends to pick-up soccer and basketball, to pool or ping pong in the rec room, you’ll. I’ve especially enjoyed the time I’ve gotten to spend with the other Seminarians from Peoria. Between eating breakfast together nearly every weekday and the many weekends hanging out and messing around at dinner, I truly feel like I am with brothers. If anyone reading this has thought about making a deeper discernment into God’s will in their life, I guarantee the search will not leave them wanting. Even before I was officially accepted by the Diocese, my discernment saw fruit in my life. Greater attendance at daily mass and adoration brought me into greater appreciation of the sacraments. I could see how my constant pursuit of God’s call to holiness was strengthened by the time I spent with the men and women I met through things like the Knights of Columbus, and young adult bible studies. The fact that Seminary has already let me grow even more so is a testament to its aid in deeper discernment, and a constant reminder of the power of God’s love in my life.